There’s a reason why he sold more than 750 million albums and counting. There’s a reason why he won 13 Grammys, had 13 U.S. #1 singles and is a household name in practically every country in the world. Because he knew the importance of embracing change. It’s easy to mock MJ for his cubist-inspired face, the result of innumerable plastic surgeries. For his unconventional attire. For his eccentric lifestyle. But when you look at his music career, he had the uncanny ability to read the current zeitgeist and bend it to his will. And not only was he a trend-altering musical force. He was an astounding dancer. An astute businessman. A highly effective pitchman. Whatever situation presented itself, he seemed to adapt to it fluidly. Yes, in business as in music, the only constant is change, and it’s the ability of companies to adapt to changing markets, economies, competitive landscapes and consumer preferences that dictate whether they are in the black or the red. 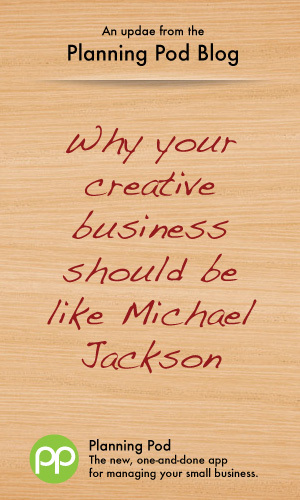 So why should your creative business – whether you’re a freelancer or run a graphic design firm, web design agency, PR firm or marketing shop – emulate a shapeshifting eminence like Michael Jackson in order to stay ahead? There’s a reason the word “new” is one of the 10 most persuasive terms in our language. Put the term “new” in any headline and, as overused as it might be, it will still make people pay attention. Simply put … people gravitate toward new things. We are curious creatures by nature (even a recent article in National Geographic reveals that the desire to explore and uncover new findings is hardwired into the human genome http://ngm.nationalgeographic.com/2013/01/restless-genes/dobbs-text ), so if something even sniffs of novelty, our pulse quickens and our senses become acutely heightened, anticipating an encounter with something we haven’t seen, heard, touched, tasted or smelled before. This doesn’t necessarily mean you need to be continually changing your brand or your offerings in response to a whimsical world. But you should be tuned into your target audience and their leanings in case you need to tweak your offerings or approach. Maybe it’s because people are always pushing for and rewarding new products and ideas. Maybe it’s because we have the attention spans of a lab rats and bore easily. But practically every industry goes through cycles where certain products, services and offerings come in and out of favor. For example, for years companies said that they wanted a full-service ad agency to provide them with all their outsourced marketing needs – from graphic design to web development to ad placement and buying to PR. But in the last decade, that trend has changed as companies as large as Fortune 500 brands and as small as local merchants have disseminated their marketing work to specialty shops and providers. And a decade from now, that trend will probably reverse itself again. Even more specifically, styles also cycle back and forth. Yesterday bright colors and clean landscapes dominated. Today we’ve seen a return to vintage motifs and palettes. Tomorrow we may see something entirely different. What causes these cycles and shifts in style isn’t as important as how you respond to them and make sure that your offerings reflect what your customers are looking for. This may currently be a bigger driver than any other in forcing businesses to reevaluate their offerings and position. A good case in point here is how digital photography has transformed how professional photographers market their services and position themselves in the marketplace. No longer do they have to compete with other photographers, now they must compete with amateur photographers and normal consumers armed with highly accurate digital cameras. The ubiquity of these devices as well as their convenience and accuracy has led many potential customers opt for taking their own pics instead of hiring a professional. Of course a wedding attendee armed with a smart phone can’t come close to the images captured by a professional photographer with serious gear, but many consumers simply don’t care and find the former “good enough” for their needs. Cases like this both demonstrate how technology can seriously hobble an existing industry (professional photography) while opening doors for a new one (that of helping consumers and amateur photographers capture and curate their photo collections). And they reveal the importance of being aware of technological advancements in your field, how they may impact your business and how you can take advantage of such innovations before they impact your core business and revenues. Planning Pod is the newest online app for creatives and freelancers to manage your projects, people and business details. See how it can help you stay organized – and ahead – by trying it free for 30 days.